What never ceases to amaze me when diving into the music of yesteryear is just how easily those lyrics (and I’m talking word-for-word) pop back into my mind. In what part of my brain are those being stored? And why can’t I remember what I ate for dinner last night? One of life’s great mysteries. In keeping with the theme, I’m throwing it back even farther with food. (Obviously, because that’s where my brain goes when left to its own devices). And next up are Keebler Cookies. It’s hard to pick a favorite because so many varieties are tried and true (and were favorites when I was a kid), but is there a more classic cookie than a vanilla wafer? 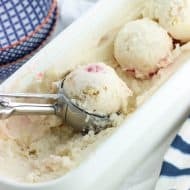 They’re just the right amount of sweet to enjoy on their own, and have a delish vanilla flavor that works itself nicely into dessert recipes. 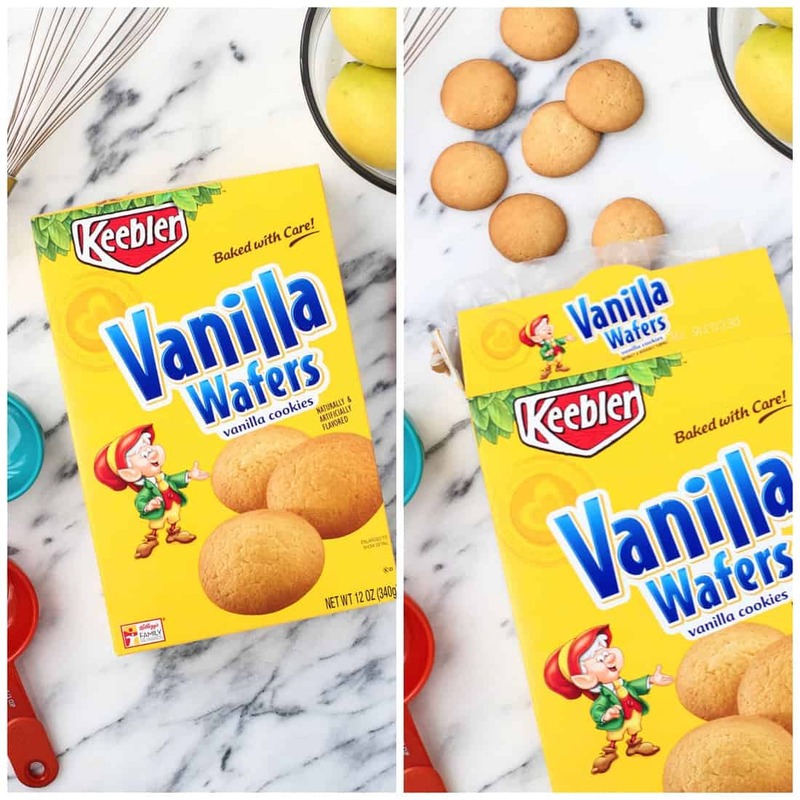 Keebler Vanilla Wafers – true utility players. 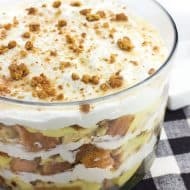 One quintessential dessert that uses vanilla wafers is banana pudding, but with the warmer weather approaching I wanted to spruce it up with a citrusy twist. 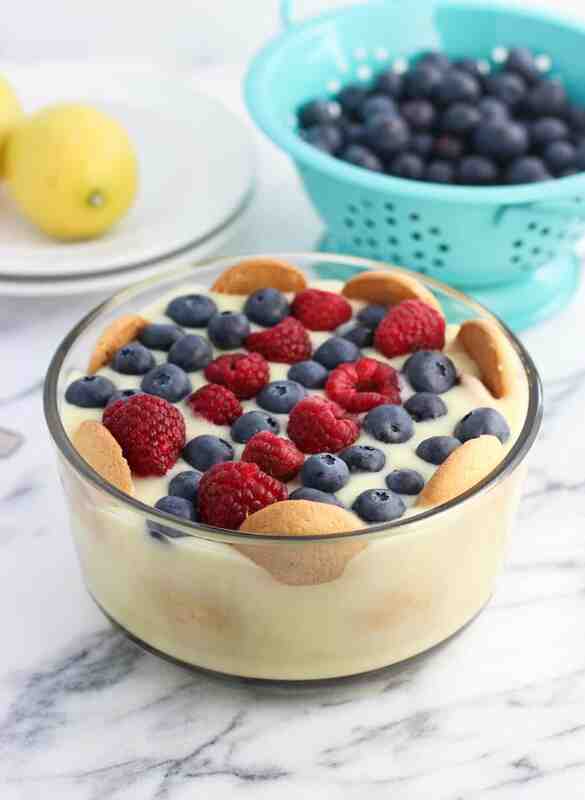 Behold, lemon pudding! 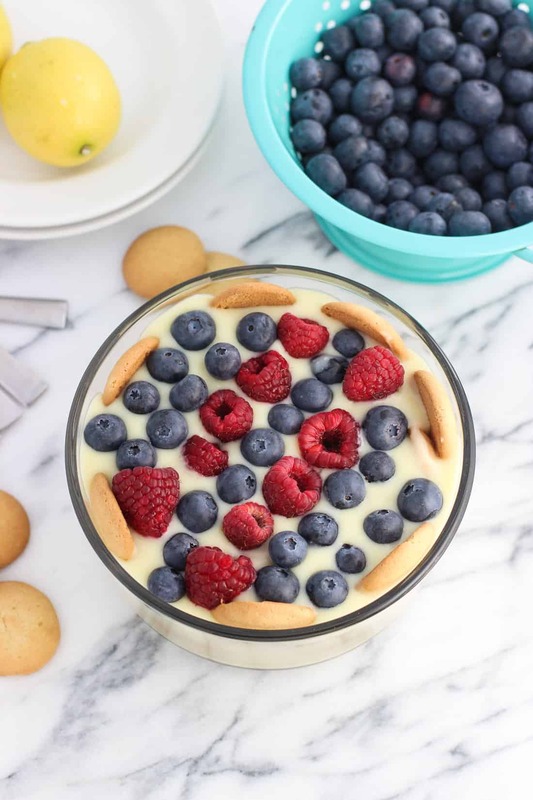 Instead of bananas, fresh blueberries and raspberries garnish the top, with classic Keebler Vanilla Wafers lining the sides and acting as a middle layer. 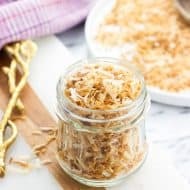 Lite coconut milk (and a bit of coconut oil) are used to significantly reduce the dairy in comparison to standard homemade pudding recipes. With the addition of cornstarch, this mixture thickens together beautifully. The pudding is a delicious balance between sweet and tart, and softens the Keebler Vanilla Wafers just like its banana inspiration. 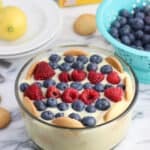 I think it’s going to be a citrus-y type of summer for me – this coconut milk lemon pudding is a keeper! Measure out sugar, cornstarch, and salt into a medium-sized saucepan and whisk to combine evenly. 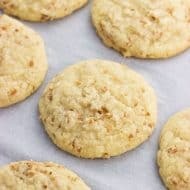 Pour in coconut milk and whisk until mixture is well-combined and smooth. Set saucepan over medium heat. In a small bowl, whisk together egg yolks until combined. Pour yolks and lemon zest into saucepan with coconut milk mixture and whisk. Stir the mixture frequently as it cooks, increasing stirring as it begins to thicken (this took about 12-15 minutes for me). The pudding will be finished cooking when it can coat the back of a wooden spoon. Remove saucepan from heat and pour in lemon juice and coconut oil. Whisk or stir until the oil has melted and the juice is well-mixed. Let pudding sit and cool until it reaches room temperature (see tip in notes below). Once room temperature, pour pudding through a strainer to remove out the lemon zest. If not assembling right away, you may refrigerate pudding to thicken before continuing. 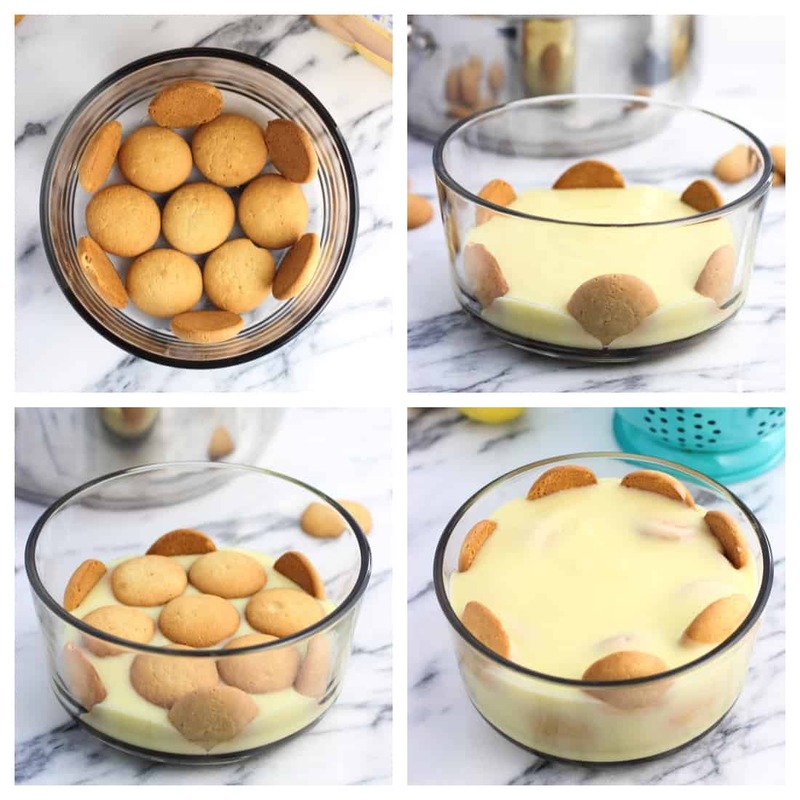 Line the bottom and sides of a four-cup dish or bowl with Keebler Vanilla Wafers. Pour half of the pudding into the dish, and then place another layer of Keebler Vanilla Wafers over top and along the sides. Pour remaining pudding over top. 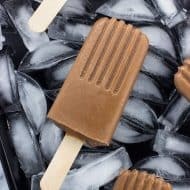 Refrigerate for at least 1-2 hours to chill the pudding. Before serving, top with blueberries and raspberries, or your favorite fruit. To help prevent a top layer 'film' from developing on the pudding as it cools, I pressed a layer of plastic wrap over top of the pudding (so, touching the pudding). Simply remove once you're ready to use and you're good to go! The quantity of Keebler Vanilla Wafers used may vary depending on the size of your serving dish. Adjust as you see fit. The prep time for this recipe includes approximately one hour for the pudding to cool to room temperature. Hey Alyssa great pudding! Did you use canned or carton coconut milk? Hi Peter, thank you! I used canned coconut milk. I’ve been listening to all the music from my college days too and I love the nostalgia! 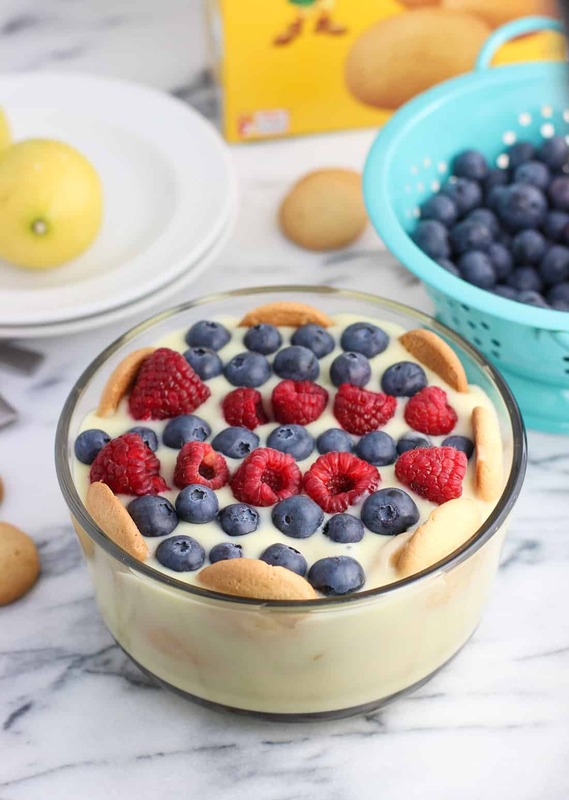 I also love any dessert that contains fruit , pudding and vanilla cookies! 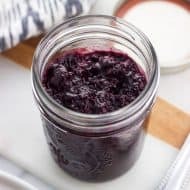 It sounds amazing and I love all those delicious berries!! Isn’t it the best?? Thanks Izzy! Hi Chichie, yes you can definitely make the pudding the night before! What a gorgeous dessert! Love the lemon flavor and berries! haha yes! It always amazes me how I remember song lyrics! My friends and I do this dinner potluck thing once a month and always play a 90s station on pandora – so much fun!! And this pudding sounds delicious! Beautiful dish Alyssa! Perfect for summer!